The attached .pdf file contains [Restoring Confidence in the BBT.pdf] a PowerPoint presentation which Madhudvisa dasa presented to the BBT trustees at their Vrindavan meeting during Kartik in 2007. The meeting was chared by Brahma Muhurta Prabhu and Jayadvaita Swami and all other important BBT trustees and members were present. Nobody, except the editor, [Jayadvaita Swami] was aware of the magnitude of the changes. After a long discussion Jayadvaita Swami admitted that apart from himself there were only two other people in the world who were aware of extent of the changes to Bhagagavad Gita that he had made. Those other two people were Dravida who he showed the manuscript to and the typist who typed the final manuscript to be sent to the printers. BBT Disobeyed This Order. Instead of Printing the Original Way, BBT Started Making Huge Changes to Prabhuapda’s Bhagavad Gita. 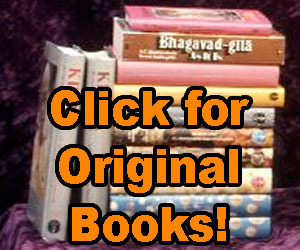 BBT Released the “Revised and Enlarged Edition” of Bhagavad Gita in 1983. The Extent of Changes Were Not Revealed to Anyone, Not Even the BBT. Changes Were Based on the False Premise that the Editor Can Change Anything He Feels Like Changing. Such changed books will never be accepted by any thoughtful person as authorative. Real typographical errors in the original books can be corrected. But only if there are footnotes notifying the readers of the correction. Thank you very much for your strong sacrifice,time,…etc in favor of the original books.You are giving so many serious arguments and I enjoy so much reading this. The first time I meet devotees was in 1974-1975 in Holland,later I meet the devotees several times in Barcelona city until I became devotee in January 1978.I feel so much benefited by your kind presentation,by your very complete work with so many arguments.Thank you for not be a brain washed devotee,and for using always the intelligence againts the normal materialistic behavior,not matter the color of the clothes,not matter the official position in the Iskcon hierarchy. Sincerely, thank you very much because of your strong sacrifice for our benefit. Please accept my humble obeisances. All glories to our eternal spiritual master His Divine Grace Srila Prabhupada. Words cannot express the appreciation of the sincere work you’re doing by studying and explaining these unauthorized book adulterations. Most devotees can’t understand the unfathomable butchering these people have done to Prabhupada’s books. Thank you for taking the time and energy to expalin point by point the changes these so called “editors” have done. Their false egos have bewildered them into thinking they are smarter than Srila Prabhupada and they have committed an offense which their spiritual lives will doubtfully ever recover from. If you ever give another presentation to the BBT, GBC or any other ISKCON gathering please invite me and I will gladly cover your back. Your servant in the service of Srila Prabhupada.